help us expand to springfield: contact your state senators today! CALL TO ACTION: Lovin’ Spoonfuls needs your help! We’re at it again — please help us make it into the Senate budget! All this week, the Massachusetts Senate will be debating the FY2019 budget for the Commonwealth. State Sen. Eric Lesser (1st Hampden and Hampshire Counties) is filing an amendment on behalf of Lovin’ Spoonfuls for $100,000 in state funding to support our expansion into Springfield and surrounding communities. Springfield has long been a priority for us, as it is home to the highest rate of childhood food insecurity in Massachusetts. State support will ensure our successful launch, leading to service to the region for years to come, much like our current operations in the Greater Boston and MetroWest communities. Please call or email your State Senators this week to ask them to support Sen. Lesser’s amendment by co-sponsoring. You can find your State Senator by visiting this website , and when you click on their name, you can see their email address and phone number. Subject: Please Co-Sponsor Sen. Eric Lesser’s amendment to bring Lovin’ Spoonfuls to Springfield! My name is _____________ and I am a constituent in _____________. I am writing in support of Lovin’ Spoonfuls expansion into Springfield, Massachusetts. Lovin’ Spoonfuls connects food which would otherwise be discarded to the people that need it most. The agency currently serves Eastern Massachusetts, feeding 35,000 people each week. Springfield is home to the highest rate of childhood food insecurity in Massachusetts. The region desperately needs the services and support that Lovin’ Spoonfuls provides. 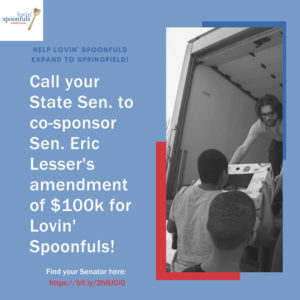 I respectfully request that you co-sponsor Sen. Eric Lesser’s Amendment #970 to secure $100,000 to fund of Lovin’ Spoonfuls’ expansion to Springfield. Thank you for your consideration and the work you do on our behalf. Thank you for taking the time to support our work with this effort. Stay tuned for updates on our progress!